The brunch scene in Chicago is diverse and vast, with over 100 restaurants in the Windy City that serve this mid-morning to early afternoon meal on weekends throughout the year. Many of these great restaurants are also near famous Chicago landmarks like the Lincoln Park Zoo, Magnificent Mile, Millennium Park and Willis Tower, while others are in colorful neighborhoods, offering an opportunity to explore beyond the usual tourist attractions. Brunch times in Chicago typically start at 10:30 a.m. to 11 a.m. on Saturdays and Sundays and end around 1:30 p.m. to 3 p.m. However, some restaurants in the Windy City do offer "brunch all day" menus and specials, so you can even enjoy brunch for dinner in Chicago. From appropriate family-friendly finds to flawless chef-driven destinations certain to make your Chicago trip memorable, you're sure to find a unique place for brunch to start off your weekend travels. Named after chef and owner Darnell Reed's great-grandmother—whose delicious southern recipes inspired him to pursue his passion for cooking as a career—Luella's Southern Kitchen is located in the Lincoln Square neighborhood a block away from the Old Town School of Folk Music. This BYOB restaurant offers contemporary updates on southern favorites like sweet potato pancakes, brown sugar and bourbon French toast, a pimento cheeseburger, and Nashville hot chicken and waffles. Located a short stroll from the Lincoln Park Zoo, North Pond Restaurant serves brunch Sundays from 10:30 a.m. to 1:30 p.m. This James Beard award-winning restaurant offers a spectacular view of a pond overlooking the Chicago skyline. Originally built in 1912 as a warming shelter for ice skaters, this redesigned restaurant now features a menu prepared by Chef Bruce Sherman using fresh, local ingredients from small farms nearby. For a flat fee per person, you can choose between seasonal dishes for a delicious farm-to-table three-course meal and order specialty cocktails from the bar for an additional charge. Like the name would suggest, Farmhouse Chicago is a farm-themed restaurant featuring rustic decor, American food, and regional beers and wines. Founded in 2011 by two married couples, Farmhouse Chicago lists where it gets its ingredients right on the menu and hires a staff focused on sustainable and responsible practices. Brunch is served on Saturday and Sunday featuring farm-to-table options like short rib hash, BBQ pork sandwiches and a farm egg scramble as well as a selection of classic, pink, or mead mimosas, a house-made bloody mary or several non-alcoholic beverages from the bar. Although the brunch menu is rather sparse with only 10 options, the selections include classics like chicken and waffles to midwestern favorites like shrimp and grits. Year-round, you can get brunch every day until 3 p.m., and during warmer months, guests can relax on the largest backyard patio in Logan Square or play on one of the outdoor ping pong tables. Parson's also serves beer and liquor, and as of summer 2018, you can now sample the newest creation of Chicago's Revolution Brewing Company: Parson's Beer. Continue to 5 of 46 below. 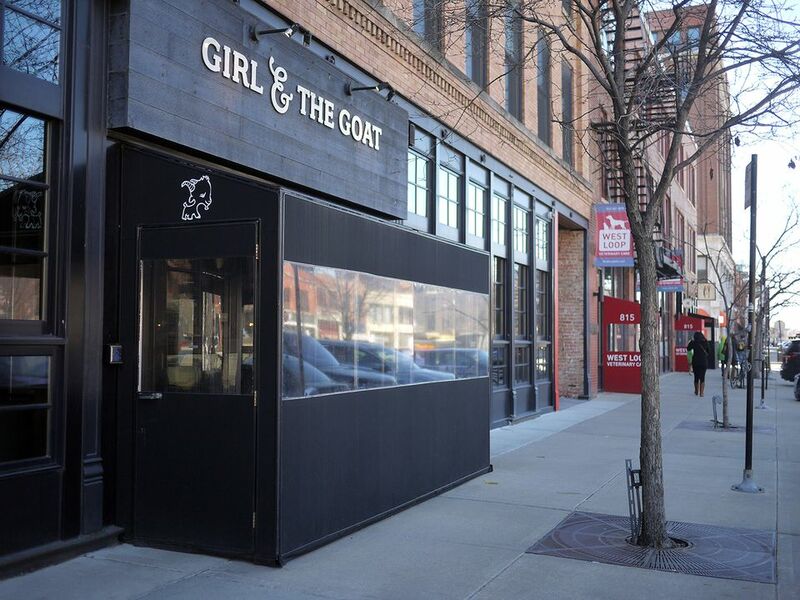 Stephanie Izard of Girl and the Goat fame opened Duck Duck Goat in the West Loop neighborhood that Chinese cuisine items like crispy frog legs, Chongqing chicken (Sichuan-style chicken with chilis), and shrimp toast. The restaurant is well-decorated and cozy, with an open view into the kitchen from almost every table and pictures of Chinese people and places decorating every wall. Duck Duck Goat also has an extensive dim sum menu, and its brunch is served Sundays from 10 a.m. to 1 p.m.
For a truly unique brunch experience, you can board the Odyssey Dinner Cruise from the Navy Pier in Chicago on Saturdays and Sundays in spring and summer. While there are many boat cruises in and around Chicago, there's nothing quite like Odyssey to enjoy a great meal while taking in all the sights of the city. Featuring an open buffet of griddled favorites alongside salads, pasta, and a meat-carving station, you can embark on a two-hour ride starting at noon on Saturday or Sunday for a flat fee. Brunch is served from 10 a.m. to 2 p.m. on Sundays at the Korean-inspired Mott Street restaurant, a local favorite hot spot in the Wicker Park neighborhood. During the warmer months, diners can settle into the cozy backyard patio and enjoy kalbi beef short ribs with eggs, black bean shrimp and grits, or a ricotta brick toast. If you want something a little different, try the Thai-style rice porridge with Issan sausage, fish sauce, ginger, cilantro, and lime known as the Congee or the "Bowl of Awesome" made of chlorophyll, yogurt, raw honey, bee pollen, hemp seeds, sprouted buckwheat, and Amaranth. Brunch-goers are treated to picturesque views of the Chicago River and skyline as they dine and drink on the lush rooftop lounge Raised, located on the third level of the Renaissance Chicago Downtown Hotel. The menu puts a modern twist on mid-morning favorites with choices like chorizo hash, beef tenderloin sliders, and lobster rolls and muffins accompanied by local honey and lemon ricotta. The "toolbox" Do-It-Yourself beverages at Raised also serve up to four guests, and selections range from mimosas to a few signature cocktails. Continue to 9 of 46 below. Just a few blocks north of the Old Saint Patrick's Cathedral in the West Loop neighborhood of Chicago, avec Restaurant offers a brunch on Sundays featuring a fusion of Mediterranean and Midwestern spices and foods. Menu highlights include wood-oven baked French toast, Moroccan pancakes with fried chicken wings, and breakfast paella with chicken confit, snail boudin, eggs, and tangerine aioli. Located in the River North section of Chicago, Bijan's Bistro offers brunch daily from 10 a.m. to 4 p.m. The restaurant is two blocks away from the Richard H. Driehaus Museum, making it a great stop for an afternoon brunch of steak-n-eggs or the breakfast king plate with three eggs, two slices of bacon, two sausages, toast, and house potatoes. Frequented by Oprah Winfrey when she lived in Chicago, Wishbone offers cuisine inspired by traditions of the Deep South. With dishes like the Savannah shrimp omelet, Kentucky scrambled eggs, and North Carolina-style crab cakes with lemon-butter sauce, Wishbone's brunch is a West Loop favorite on Saturdays and Sundays. Menu items are relatively inexpensive here, and the full bar sometimes offers discounts on cocktails when dining for brunch. Located in Maggiano's Little Italy, GT Fish & Oyster is a trendy seafood restaurant that offers a menu of shared plates for brunch on Saturdays and Sundays. The globally-influenced menu consists of house-made churros, smoked whitefish quiche, biscuits in lobster gravy, and brioche French toast with bananas, Nutella, and hazelnuts. The dedicated brunch cocktail menu is also quite extensive with everything from the standard mimosa and Michelada to bellinis and a special bloody mary with your choice of Ketel One Vodka or Dickel Bourbon. Continue to 13 of 46 below. With daily happy hours and brunch on Friday through Sunday, Oyster Bah is a great place to go any time of day. The little sister restaurant to Shaw's Crab House, Oyster Bah is located in Lincoln Park and offers a menu prepared by the same executive chef for a much lower price. Brunch specialties include Chef Donny's breakfast potatoes, Bah's famous cereal-crusted French toast, smoked trout frittatas, and a fried oyster benedict. Although this farm-to-table American comfort food restaurant is a little far from the action of downtown Chicago, the North Logan Square neighborhood has become a hipster haven in recent years. Longman & Eagle has become a local favorite for brunch of Saturdays and Sundays, especially for the BPR breakfast, which features two eggs, house-made sausage, homestyle potatoes, and an ice-cold can of Pabst Blue Ribbon beer. You can also order traditional southern favorites like fried chicken and waffles with a sweet potato and pork belly hash or the cinnamon-spiced brioche French toast with praline pecans. If you're looking for a good deal on brunch in the West Loop neighborhood, Au Cheval serves traditional diner fare with a focus on eggs. After all, its name is a food phrase that means "with an egg on top." The wait can be up to two hours on Saturdays and Sundays for brunch, but with tasty menu items like cheeseburger á cheval, chilaquiles, and crispy potato hash with duck heart gravy are worth the time in line. A few doors down from the Old Town School of Folk Music, Bistro Campagne is an upscale restaurant offering French comfort food with farm-to-table ingredients. Brunch is served every Sunday and features a menu that changes with the seasons (depending on what crops and meats are available), enhancing classic French country classics like crepes Suzettes, duck confit hash, and brioche French toast. Continue to 17 of 46 below. Located just two blocks from Willis Tower inside the JW Marriott Chicago, The Florentine offers bottomless mimosas and bloody mary cocktails on Saturdays and Sundays from 11 a.m. to 2 p.m. This Printer's Row neighborhood restaurant offers an Italian twist to brunch as well as seasonal dishes featuring high-quality, local ingredients. The Amatriciana with sunny side eggs, caramelized onions, pancetta, spicy tomato sauce, and grilled sourdough is particularly good, as is the spaghetti and meatballs special. Although technically located at the Vermilion Restaurant, the Dosa Frankie Brunch Bar opens up on Saturdays and Sundays from 11 a.m. to 2 p.m. Featuring Vermillion's Indian street fare with a brunch twist, the menu features traditional crepe-style dosas or frankies (Indian wraps or roti rolls). These dosas can be filled with a variety of breakfast ingredients or chutneys including sundried tomato chimichurri, eggplant coconut chutney, and tamarind shrimp. Located in the Gold Coast neighborhood of Chicago, just a short walk away from Oak Street Beach and the Museum of Contemporary Art, Chicago Q is one of the city's favorite BBQ restaurants with brunch service offered daily. Along with signature BBQ items like smoked chicken or Kobe brisket eggs Benedict, you'll also find tuned-up brunch dishes like cheddar chive biscuits and gravy and carrot cake pancakes. For an additional fee, you can also buy in for some bottomless mimosas on Saturday and Sunday. The ultimate brunch spot for hungover foodies is The Bristol; the menu actually features a "hangover breakfast" of noodles, pork broth, shrimp mousse, and pork belly. Alternatively, you could soak up the alcohol with a smoked gouda burger topped with duck confit, cherry peppers, grilled Vidalias, and dijonnaise. Brunch is served on Saturdays and Sundays from 10 a.m. to 2 p.m.
Continue to 21 of 46 below. Located a short stroll from the Magnificent Mile in Chicago, the French-inspired menu at Bistronomic features a delicious traditional croque monsieur alongside short-stack pancakes, French toast, omelets, and pork belly Benedict. On Saturdays and Sundays, guests can also pay a little extra for a two-hour bottomless mimosa special from 10 a.m. to 2:30 p.m.
With locations in Lincoln Park and River North, Taco Joint is a pretty reliable option for a Mexican-inspired brunch in Chicago, even on the busiest tourist weekends. The menu features bottomless cocktails like Palomas, Micheladas, sangria, margaritas, and Bloody Marias alongside breakfast fusion dishes like crispy pork carnitas with pancakes covered in citrus-chile maple syrup and gourmet breakfast burritos stuffed with tomatillo scramble. If you're looking for a boozy brunch, you can head over to the lobby-level eatery Baptiste & Bottle inside the Conrad Chicago. The Saturday and Sunday brunch menus feature down-home favorites like cinnamon rolls served piping hot in the skillet and crispy fish sliders with house-made coleslaw. For an additional flat fee, you can indulge in an unlimited bloody mary bar that's filled with all sorts of homemade mixes and garnishes served with bourbon, vodka, or tequila. On Saturdays and Sundays at 80Proof you can get the "Almost Famous Feast" for access to an all-you-can-eat brunch buffet featuring a variety of carved meats, desserts like "boozy" doughnuts, an eggs Benedict and omelet station, and a gelato cart and Nutella crepe station. For an additional price, guests can also get access to the bloody mary bar or mimosa package. Continue to 25 of 46 below. Directly across the street from the United Center, you'll find a South American restaurant unlike any other in the city. Sinha Elegant Cuisine was opened by a Brazilian-born woman who still curates the weekly Sunday brunch menu. Featuring live entertainment, samba dancing, and an all-you-can-eat spread of classic Brazilian dishes such as fish stew and black beans with seasoned basmati rice, Sinha Elegant Cuisine is a great BYOB brunch spot if you're looking for something south of the border. You can plan a leisurely day in Chicago that begins with a trip to the John Hancock Observatory and ends with brunch in the Signature Room. This casual yet upscale restaurant offers unobstructed views of the city and assorted charcuterie, gourmet soups, chilled seafood, and desserts in a buffet-style setting. Diners can also choose from made-to-order entrees such as brioche French toast, brie and pear quiche, steak and eggs, and chicken piccata. If you're looking for a fun breakfast or brunch buffet, Norman's Bistro offers a weekly gospel brunch on Sundays with live music followed by Sunday Jazz Night. The buffet includes sweet potato pancakes, BBQ spare ribs, fried chicken, house-made pastries, an omelet station, a carving station, and non-alcoholic beverages. Just a short walk away from the Navy Pier, Shaw's Crab House is one of Chicago's most highly regarded seafood restaurants. A buffet brunch is served Saturday and Sunday from 11:30 a.m. to 1:30 p.m. featuring an omelet and waffle kitchen as well as a surf & turf station and cold seafood bar. Although the prices are a bit steep for brunch, this flat-fee buffet is the best deal for seafood in Chicago. Continue to 29 of 46 below. Southern-focused classics are served all day at this relaxed family eatery in Chicago's historic Bronzeville neighborhood. The menu features options like made-to-order omelets, fried catfish, home-style potatoes, grits, and buttermilk biscuits, making it the perfect place for a "down home" southern cooked' brunch. Pearl's Place has been a neighborhood staple for decades, contributing to several community events and organizations each year. Ranked the "Best Brunch in Chicago" by Candé Nast Traveler Magazine, Peach's on 47th offers breakfast and lunch items from 7 a.m. to 3 p.m. daily. Deeply rooted in the African American community of Chicago, Peach's is a neighborhood staple and just a quick drive from Hyde Park, where you'll be near President Barack Obama's home. In addition to such specialties as salmon croquettes and cheese grits, peach bourbon-infused pancakes, and fried chicken with sweet honey butter, you can also choose from egg white omelets and gluten-free pancakes. This Old Town restaurant is just a few blocks away from the Chicago History Museum and serves up all of your morning favorites for under $14 all day long. Although this restaurant doesn't sell alcohol, it encourages you to bring your own beer and liquor, which you can mix with fresh juice. Strawberry Belgian waffles, crunch French toast, and chili-avocado frittatas are among the top items offered on the brunch menu. Located near Logan Square, Lula Cafe was one of Chicago's pioneers in the local, organic, and sustainably-gathered cuisine. The brunch is particularly popular here and is offered daily from 9 a.m. to 2:30 p.m. except for Tuesdays when the restaurant is closed. While the menu is limited, you'll definitely seasonal dishes like the sweet grain porridge and various house pastries or menu staples like the potato crepe with a beef short rib or "The Royale" sandwich with porchetta, arugula, pecorino, crispy leeks, walnut aioli, and a sunny side up egg. Continue to 33 of 46 below. Stephanie Izard’s contemporary West Loop diner is open all day, and you can order breakfast or brunch any time of day. This menu at this kid-friendly restaurant features favorites like dark chocolate chip crunch pancakes with chocolate malt butter, gooey homemade cinnabuns, and Fat Elvis waffles with bananas, peanut butter, and bacon maple syrup. Located in the quaint neighborhood of Roscoe Village, Kitsch'n on Roscoe is a quirky restaurant offering throwback dishes like Green Eggs & Ham, candied bacon BLT, cinnamon toast, and various takes on the classic French toast. The restaurant is also not too far from Wrigley Field, home of the Chicago Cubs Major League Baseball team, and the Southport Corridor shopping district, where you can browse some of the biggest designer names alongside local artists and vendors. With locations across the United States in Orlando, San Diego, Las Vegas, and Plano, Texas, Hash House a Go Go offers a modern twist on farm-to-table meals. Brunch and breakfast items are served all day at this quirky spot where you can order hash served with either fruit and biscuits, egg scrambles, or one-pound burgers. The crispy Indiana hand hammered pork tenderloin benedict and the farm scrambles are among the local favorites on the menu. With a location just outside the Chicago O'hare Airport as well as in the bustling River North neighborhood of the city itself, Bub City is a great place to grab a BBQ-inspired brunch while listening to country music. You can order the "brunch & three" for an entree and choose from cheesy chilaquiles, a breakfast BLT, or a brisket burrito served with three sides (BBQ bacon, Texas hot links, griddled ham, or crispy tots). Country bands perform at noon and brunch is served Saturdays and Sunday from 10 a.m. to 2 p.m.
Continue to 37 of 46 below. What started off as an unassuming little breakfast spot in the South Loop now has six locations to choose from in Chicago: Streeterville, Marina City, River North, Lakeview, West Loop, and South Loop. Yolk specializes in "superior egg dishes" but especially shines at its fluffy frittatas and tasty crepes. The bright and cheery atmosphere in each of Yolk's locations make it a great place for kids to start the day in the Windy City, and brunch takes place on Saturday and Sundays from 7 a.m. to 3 p.m.
A few blocks south of Northwestern University, the West Egg Cafe is an egg-centric American restaurant that's only open for daytime dining. Their signature omelets are made with ingredients such as chorizo, green chiles, corned beef, or broccoli, and they also prepare gourmet waffles and French toast on demand. Within walking distance of two beaches and the Navy Pier, eating at the West Egg Cafe is a great start to any day of the week in Chicago. Although lines can last up to two hours at the Wicker Park location, The Bongo Room also has a quieter uptown restaurant that offers a family-friendly venue for American-style brunch foods. The menu is quite exquisite with creations like the Chocolate Tower French Toast, the BLT Benedict, and the sweet potato and black bean burrito. There are also additional locations in Andersonville and the South Loop. Located in Hyde Park, just shy of the Museum of Science & Industry, the Lake Shore Cafe is a sprawling, two-level restaurant that offers a budget-conscious buffet. Brunch is served Sundays from 11 a.m. to 4 p.m. and features a salad bar, smoked salmon, fried chicken, honey-glazed ham, made-to-order Belgian waffles, BBQ ribs, and an omelet station. Guests also get one complimentary glass of Champagne (and unlimited juices and coffee) with the flat rate fee for the buffet. Continue to 41 of 46 below. The brainchild of Michelin-starred chef Paul Kahan, Publican cranks out unconventional bites to the delight of its many fans. Brunch is served on Saturdays and Sundays, and the menu seasonal and consistent with a few savory standbys. You can always expect to find local favorites like red wine poached eggs with prosciutto and sourdough; maple syrup-braised bacon; pork schnitzel with waffles; and the signature Publican "mimosa" of Belgian beer and freshly squeezed orange juice. With a location in both the Edgewater and Lake View neighborhoods, Ann Sather Restaurant has become a Chicago institution when it comes to breakfast cuisines. Just a five-minute drive to the Center on Halsted in Chicago, Ann Sather's famously sticky cinnamon rolls are a big hit among locals at both locations. You can also find a variety of omelets, waffles, and pancakes on the menu when brunch is served on Saturdays and Sundays from 9 a.m. to 2 p.m. If you're looking for a place to watch sports while you enjoy brunch, you can head over to the Old Town Social sports bar, which offers a chef-driven brunch to compliment the action. You can dig into generous portions of turkey pastrami hash, grilled sausage and waffles, Bananas Foster French toast, and piping hot beignets on Saturdays and Sundays from 11 a.m. to 3 p.m. The Near North Side neighborhood is full of hotels, tourist attractions, and fine dining restaurants, but the Nico Osteria inside the Thompson Chicago Hotel is one of the best places to get Italian-style seafood. Brunch is served Saturdays and Sundays from 9 a.m. to 4:30 p.m. and features unconventional dishes like porcini-rubbed hanger steak and eggs, the butternut squash hash, and Tagliolini, an Italian dish with clams, leeks, and chile in white wine. Continue to 45 of 46 below. Featuring riverfront views and a British-American fusion menu of brunch favorites from both sides of the pond on Saturdays and Sundays, River Roast has become a River North staple for Chicago-style blues and great food. Local bands rotate weekly as guests chow down on updated Southern dishes like shrimp and bacon po'boys, rabbit and waffles, and a Lowcountry Croque Madame on sourdough bread. The Tack Room is a hip piano bar inside the Pilsen's award-winning Dusek's Restaurant, which features a jazz brunch on the first Saturday of the month from 11 a.m. to 3 p.m. The Good Luck Jazz Brunch features Dusek's menu items like the board & beer breakfast with a High Life pony, a spinach and maitake mushroom omelet, or fried chicken & waffles as well as Tack Room bar specials like the Tack Room Buck with Rebel Yell Bourbon, carrot-ginger beer, and lemon.